OUR FOSTER BOUNDARIES HAVE EXPANDED! Are you interested in becoming a BARC foster parent, but live outside the City of Houston limits? Well, we have good news! We now allow anyone that lives up to 15 miles outside of the City limits to foster with us! If you're not sure how far outside of the City Limits you live, just type your address into this link. If you live inside the colored area, you are qualified to be a BARC foster! Saving lives is our top priority, and we hope this change will save many more animals through our foster program. 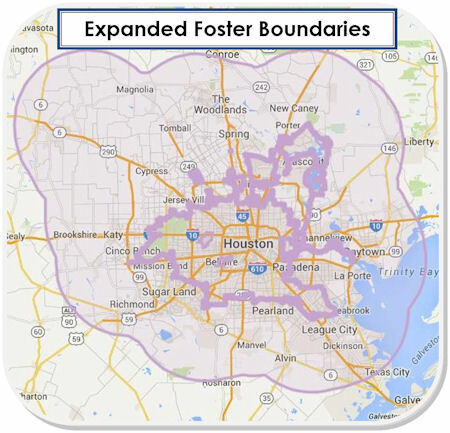 If you have questions about your location related to our foster program, please email barcfoster@houstontx.gov. We can never turn away an animal. Whether the animal is a goat, a goose or an alligator; a thirteen-year-old schnauzer or a one-day-old kitten; an emaciated dog or an obese cat; a kitten with chemical burns, or a cat shot with an arrow; we take them all. And, because of Houston’s climate and size, we never get a break. The animals are constantly coming in. We need your help with the animals that need special care. They might be too young, too sick, or too shy. They may have ringworm, mange, or heartworms. They may be mothers nursing kittens or orphaned kittens in need of bottle-feeding. All of them need help. They need you. Fosters change lives. Fosters put in the time and effort the shelter sometimes just isn't able to due to the numbers of animals we have here. Sometimes all a foster needs to do is provide some love and patience and a second chance to a shy dog; other times it's waking up at three a.m. to bottle-feed some hungry kittens. There are many different options within fostering and many different levels of time and emotional commitment. With every kind of fostering, though, the goal is the same: to help every foster animal become adoptable and to find every foster animal a forever home. We can't control the number of animals coming into BARC, but you can help us control the number that make it into loving homes. You can help us give these animals a chance. Fosters must live inside the City of Houston. Exeptions include Humble, West University, Bellaire, Hedwig, Bunker Hill, Piney Point, Hunters Creek and Spring Valley. If you live outside the City of Houston, there are many other rescue organizations in need of fosters. Ask us for a list of rescue organizations who work with us. Fosters must be over the age of eighteen. Foster Application and Agreement must be filled out in-person at BARC, identification required. Foster animals are the property of BARC. A committed group of fosters can make all the difference in any shelter and can change the lives of countless animals. By becoming a BARC foster, you will be changing the life of every animal you foster. Interested in becoming a foster? Got questions about fostering? Email or call us! we are happy to help!